Fahy, Tony 193 Ballinclea Heights, Killiney, Co. 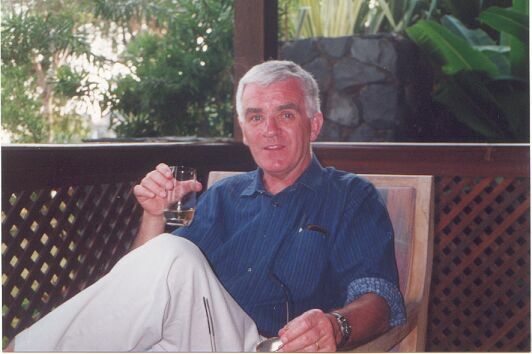 This photograph was taken on Langkawi island in Malaysia in March 2002. It was a shock to look at a photograph of myself from 2002 – wow, and also from Malaysia! You asked for a date of birth. Nowadays, I prefer to mark other people’s birthdays than my own. I’m a Second World War baby – born on 7 November, 1939. Thank you Peter for keeping in touch and for reminding all of us ‘grey beards’ and ‘grey curls’ about the GEAR Plus contact file. First, Peter, let me congratulate you on your great energy in producing yet another book on Mr. Daim. I really admire your relentless intellectual curiosity and energy in being so active in your semi-retired state. I note that you are also supporting Greece by holidaying there as you have been doing for many years. Those of us in the unfortunate ‘bail out bucket’ of the EU appreciate the patronage and help of the partner countries. It’s also great to hear from the other former colleagues, and, as Wim said, the good memories of the old GEAR days live on.I think that when we learn about the activities of our former colleagues, it can act as a stimulus to do more in our own lives as we are now being told that, all being well, we may live longer lives than our parents. Here is a quick summary of my own CV. Aged 71, I am now fully retired from all revenue earning activities. We have two grand-children living in Sweden.
. I’m a long standing member of the local county Choir – we sing classical music – religious and secular – and hold public performances about twice a year. I sing bass (having been a tenor I was moved to the basso line two years ago).
. I’ve been interesting in wine all my life and helped to found a Wine Club in the south Dublin area. I have chaired the Club for a number of years but am now an ordinary (drinking and tasting) member. I meet with a groups of friends for ‘liquid’ lunches at intervals!!
. I try to keep fit by walking regime every day – I need to get our every day, hail, rain or shine – for about an hour.
. I’ve become interested in cooking in recent years as Eva continued after I retired. I have a lot to learn, of course, but I enjoy the challenge and am considering doing a cookery course at a Cookery School soon.
. Having an interest in history and politics keeps me in touch with the wider world. History can also be a reason for taking holidays in particular places. Next week, for example, we are off to Sicily for one week.
. Our daughter is married with two young children in Stockholm. We find ourselves visiting Sweden a couple of times a year and we also host the family here on their Irish holidays. My best wishes to all my former colleagues. It’s good to keep in touch so thanks again Peter for managing the GEAR Plus site.